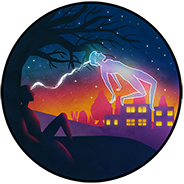 Astral projection is an exercise where a person willingly aims to separate their mind and body for the purposes of exploring alternate realms of consciousness. Astral projection is well documented, although there remain sceptics. The truth is that there has been no hard scientific study into proving astral projection as a scientific fact. Astral projection has many contemporary practitioners, as well as historical ones. There are many historical tales of the mind going on a fantastic journey while the body remains at one location. Stories are especially prevalent in cultures of the Indian subcontinent, where many forms of yoga include practices that are similar to astral projection. Generally, Astral projection can occur two ways; spontaneously or through practice. There are many techniques to achieve an astral projection. Many of these involve a form of relation and self guided meditation. Luckily, this entire site is dedicated to astral projection!